Gibson City, Illinois, has a wonderful German restaurant, “Bayern Stube”, where you can enjoy all sorts of authentic German dishes. And if you’re a bit tired out after your flight, you might even consider staying the night in their new bed and breakfast. On this flight, you can leave your fancy electronic navigation radios behind. You’ll be taking off and landing at fields that do not have control towers, and you will not be flying through any special airspace, so you will not need to use your communication radios at all. (It’s still a good idea to self-announce your position in the pattern during take-off and landing, however.) You’ll also remain outside the 30 nm limit of the Chicago Class B airspace, so you won’t need to use your transponder (regulations do require that if it is installed and working, you must use it, so set it to “1200” for VFR flight and forget it). And even though there are VOR and NDB beacons available for your flight, we’re going to ignore them entirely. You have now become an old-fashioned “IFR” pilot; in this case, the acronym stands for “I Follow Roads”! You can pretend that your aircraft doesn’t have any radios—this is known as “NORDO” (for “no radios”). If you were to use VORs (or GPS or Loran if you had it), you could fly direct from Morris to Gibson City over a distance of about 57 nm. In the real world, you could come close to this distance by following the river from Morris to Kankakee, but unfortunately the river was not included in the FS5.1 default scenery, so you’ll have to take the long way around. Finally, this flight will test your landing skills. The landing phase of any flight is one of the trickiest parts, but after a long cross-country where you have to pay close attention to your navigation, you may find that you’re not quite as sharp on final as you might be when you’re just practicing bump and goes in the pattern. To complicate matters a bit, I picked Gibson City as your destination on purpose. There’s no shortage of runway length to land on, with 3,400 feet of tarmac to aim for, but you may find the strip a bit narrower than what you are used to; it’s only 30 feet wide. This has some implications for your landing, which we’ll cover a bit later. I’ve marked your route and major checkpoints along the way on a portion of the WAC (World Aeronautical Chart) for this part of the country. I also have prepared the flight log for this trip, with the fixes corresponding to the numbered points on the chart. You will depart from Morris on Runway 36, then turn to the southeast. About four miles away (all references to miles are nautical miles) you will see two roads, and you’ll follow the southernmost of the two; this is Route 6. It will lead you northeast to the intersection of Interstate 55 southwest of Joliet. There is a break in the road about two miles east of this intersection, and a new road, US-52, starts at Preston Heights and leads you southeast. The road jogs to the left where it joins Route 20, but you can continue on straight to pick up US-45/52 about six miles north of Kankakee. South of Kankakee, Interstate 57 crosses US-45/52 near the Kankakee airport. Turn and follow I-57, and keep track of the towns as they pass by. There are five towns, each about 4 miles apart, which means that you should pass one every two minutes or so. Right after Gilman, there is the town of Ornaga (which shows as two parts on US-45 in the scenery) but it’s too close to Gilman to use as a checkpoint. Buckley is 10 miles from Gilman; next you’ll come to Loda about file miles after Buckley. At this point, you should be able to see Gibson City off to the southwest, about 10 miles away. If you can see the airport, go ahead and turn toward it. If you continue to follow I-57, you’ll come to Paxton about four miles after Loda. It has an airport of its own, on the west side of the highway. Turn west and you should be able to see Gibson City. Use the flight log to track your progress and to keep track of your position. You won’t have any of those new-fangled radios to help you find your way, so pay close attention to the roads and towns as you pass them. Start by using the World Airports menu to position yourself. Choose “Morris - Runway 36” from the “USA - Chicago” area. Set your transponder to the VFR code: 1200. You can ignore all the other radio settings. Even though you’ll be flying by the seat of your pants, there are still some requirements and suggestions to keep in mind. First, climb to pattern altitude at Morris (1,400 feet) before turning to the southeast. Since your course will be to the east of north, you should fly at an odd thousand plus 500 foot altitude, so continue your climb up to 3,500 feet. You could climb up to 5,500 feet, but this might make it more difficult to keep track of the roads and towns. Once you reach your cruising altitude, adjust your pitch and throttle back for a cruising speed of about 135 knots. This is what we have used to come up with the times in the flight log, though you can change them if you pick a different cruising speed. There’s no Class D airspace at Kankakee, even though it has a control tower, so you won’t need to talk to anyone on the radio as you go by. Out of courtesy, however, you might give the tower a call to let them know where you are and where you’re going. After you turn to follow I-57, your course will be west of north, so you should climb to an even thousands plus 500 foot altitude for VFR flight. Go to 4,500 feet. What goes up must come down, and the pattern altitude at Gibson City is 1,500 feet. This means that you will need to lose 3,000 feet before entering the pattern. Since you will be approaching from the east, and you will use Runway 36 for your landing, the best approach is to cross over the runway at midfield, above pattern altitude. Then make a 270-degree descending turn to the right which will put you on the proper 45-degree entry into the pattern. Assuming that you want to cross the field at about 2,000 feet and will make an en route descent at 500 feet per minute, you will need to start your descent about five minutes from the field, or about 10 miles. This means that you should start your descent just before you arrive at Loda. 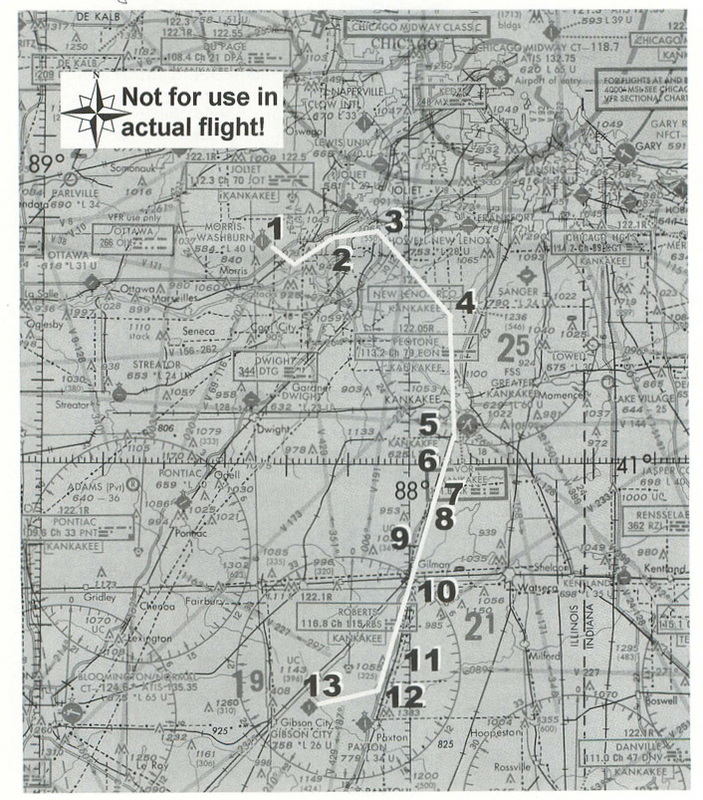 As mentioned at the top of this article, Gibson City is a long and narrow runway. If you’re only used to landing at big fields like Meigs where the runways are 100 to 150 feet wide, you will need to be prepared to make a number of adjustments when landing at Gibson City. The narrower runway means that it is harder to get lined up on final; plan on extending your downwind leg just a bit more than usual, so that you have plenty of time to get established on a controlled final leg. Also, the visual cues will be very different as you cross the threshold, which can wreak havoc with your flare and touchdown. Don’t be dismayed if you bounce the first time or two when landing at a narrow field, since you will feel as if you are higher off the runway than you are. Finally, Gibson City is so narrow that FS5.1 doesn’t show a center stripe for the runway; be careful to keep it on the straight and narrow after you touchdown. If you want to add some challenge to the flight, consider setting up the weather so that you have 10 or 15 knots of wind out of the north. If you make it directly out of the north, you won’t have to worry about cross-wind landings (which are difficult without rudder pedals) but will still have to cope with crabbing your course to stay over the roads. If you have rudder pedals, veering the wind around to the northwest by 20 to 30 degrees will keep you busy on your final approach and landing. Whether you choose to fly with wind or in the calm, clear skies of the FS5.1 world, you’ll have the satisfaction of knowing that you can find your way around without relying on radio navigation aids. And when you get to Gibson City, don’t forget to try the sauerbraten.